Livorno passenger and car ferry ticket prices, timetables, ticket reservations and information for ferries sailing from Livorno to Barcellona, Bastia, Golfo Aranci, Olbia, Palermo, Tanger Med, Termini Imerese and Valencia. Compare all available Livorno ferry ticket prices in real time and book the cheapest available Livorno car and passenger ferry tickets sailing to and from Livorno, Barcellona, Bastia, Golfo Aranci, Olbia, Palermo, Tanger Med, Termini Imerese and Valencia with Grimaldi Lines, Corsica Ferries, Moby or Grandi Navi Ferry Line ferries online with instant confirmation. Book Livorno Ferry Tickets with Grimaldi Lines, Corsica Ferries, Moby or Grandi Navi Ferry Line for ferries sailing from Livorno to Barcellona, Bastia, Golfo Aranci, Olbia, Palermo, Tanger Med, Termini Imerese and Valencia online in advance to enjoy the cheapest available ferry ticket price. The price you see is the price you pay. There are no hidden extras or surprises such as added fuel surcharges or booking fees and we do not charge you anything extra for paying with a Visa Electron card. The price we quote you for your selected Livorno passenger or car ferry ticket, onboard accommodation and vehicle type is all you will pay, and that's a promise. To obtain a Livorno ferry ticket price and book your ferry ticket securely online please use the real time ferry booking form on the left. You are also able to add a hotel at your destination, or anywhere else, to your ferry ticket when completing your ferry ticket reservation. The Port of Livorno is one of the largest Italian seaports and one of the largest seaports in the Tyrrhenian Sea basin. The port is also an important employer in the area, with more than 15,000 employees who provide services to more than 7,500 ships every year. Livorno is a busy port and the city lies on a series of wide canals giving it an atmosphere that is unique in Tuscany. It has a great food market and some excellent fish restaurants and, despite extensive war damage, still retains many fascinating points of interest which together recount the town’s four-hundred years of history. The surrounding province of Livorno, stretching to the south, offers a mixture of well-equipped seaside resorts and stunning wild sandy beaches. Away from the coast, the gentle hilly landscape is dotted with many small towns and villages of great charm. The people of Livorno are renowned throughout Italy for their rather rebellious and even anarchic nature. “Come to Livorno and do as you please” goes the saying, and there is certainly an element of truth in that. Livorno, the Tuscan gateway to the Mediterranean Sea, is crossed by canals and situated by the seaside. Planned as an ideal town in the 16th century, Livorno reveals its history through its districts characterised by the Medicean canals, which are still navigable, and through its port, overlooked by towers and fortresses, leading to the town centre. Around the middle of the 19th century, the first bathing establishments of Italy appeared in Livorno. This tradition still continues thanks to the town's bathing establishments, hospitable and welcoming, situated along the shoreline promenade that stretches for many kilometres among impressive 19th-century buildings, villas in the Liberty style and the green vegetation: pine trees, tamarisks and oleanders. There are many places of interest by the sea, such as: the Naval Academy, a prestigious training school for officers of the Italian Navy founded in 1881, the city Aquarium, the Natural History museum of the Mediterranean, the Caprilli racecourse, a hundred-year-old setting for important horse racing seasons, and the Terrazza Mascagni, which offers a wonderful view over some of the islands of the Tuscan archipelago: Elba, Capraia and Gorgona, as far as Corsica. Just beyond Livorno the pinkish stone cliffs of Calafuria and Romito stand above an amazing crystal-clear sea. This corner of Tuscany, between Livorno and Piombino, is called the Etruscan Coast. Best Price Guarantee - We always offer you our lowest available Grimaldi Lines, Corsica Ferries, Moby or Grandi Navi Ferry Line passenger and car ferries ticket price to and from Livorno. There are no hidden extras or surprises such as added fuel surcharges or booking fees and we also we do not charge you anything extra for paying with a Visa Electron card. The price we quote for your selected Livorno ferry ticket, onboard accommodation and vehicle type is all you will pay, and that's a promise! In the unlikely event you find the same all inclusive Livorno ferry ticket cheaper in the brochure of any other tour operator we promise that we will do our best to beat that price or offer you the choice of requesting a refund. 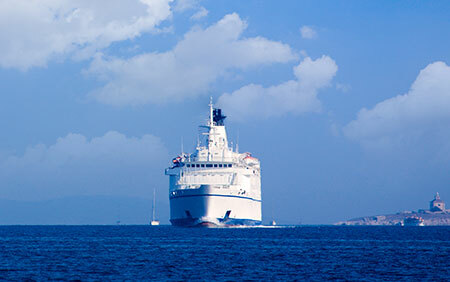 To book Livorno car and passenger ferry tickets please click here. At ferryto.com you are able to obtain live Livorno ferry ticket prices, check availability and book car and passenger ferry tickets to and from Livorno at our lowest available ticket price. Ferryto.com is part of the world's largest online ferry ticket distribution network providing the ability to book over 80 major European ferry operators including to Livorno and to over 1,200 other ferry routes throughout the UK, France, Spain, Ireland, Holland, Eastern Europe, the Mediterranean, the Baltic and North Africa.